Cars and trucks travel too fast past the barn. A few weeks ago, Chloe, a feral black and white cat, was hit by a car and left in the ditch alongside the road. Donna saw the stiff dead cat when she rode past on Socks. Later that afternoon, Connie walked down Murray Creek Road and retrieved the lifeless cat. She dug a grave in her garden where other pets lay decaying in the earth. There are always cats in the barn, most are hiding and unseen. Feral cats born in the woods, looking for a warm, safe place to live; they are the wild cats which hunt for mice and hid in the barn. And then there are the other cats which come to the barn in the middle of the night. These cats are dropped off at the parking lot or near the hayloft, unwanted and abandoned. Last week, someone secretly walked into the barn, stepped quietly by the tack room and deposited 7 tiny kittens near the water barrel just outside Myrtle’s stall. In the morning, I came up to ride CJ and was greeted by a kitten, and then I saw two more hidden behind a saddle stand next to my tack box. A few minutes later Connie drove up and came into the barn. “Someone dropped off a bunch of kittens. Johnn saw them this morning,” said Connie. It wasn’t long before we located the kittens. The little furry animals came hurrying out to see us wanting to be picked up and petted. They walked around our feet and vied for our attention. “I’ll make some calls. There used to be a feral cat program but that folded and the animal shelter is full; they aren’t taking anymore cats. 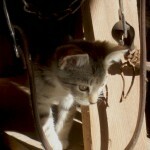 It’s not really fair to expect kittens used to living in a home to live the life of a barn cat. They’ll have to be neutered and spayed otherwise, in a month or two they’ll start breeding and we’ll have more cats than we can count. The barn already has 21 cats,” Connie said picking up the bag of cat food. Some farmers do nothing about barn cats. The farmers just let them breed and expect the cats to live off the mice and rodent population. The animals die from accidents, disease and natural causes. Johnn and Connie have a different approach; control the cat population and keep the cats healthy. They feed the cats and make sure the animals get their shots; otherwise, the cat population could pose a health threat to people and other animals in the barn. Cats reach reproductive age around 6 months old and breed twice a year. It is estimated that one female and her offspring in 7 years can produce 370,000 kittens. Instead of facing a living nightmare of multiplying cats, Connie traps any feral cat which comes on the property and has the animal spayed or neutered. 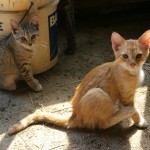 Now Connie and Johnn are faced with a huge bill for the 7 kittens someone dumped off at the barn. The expense out of pocket for Connie and Johnn to spay or neuter each kitten Connie estimated somewhere between $60 to $100, multiply that number by 7 and the total cost comes to between $420 and $700. Not a small sum of money to take care of somebody else’s kittens. Meanwhile, the kittens were everywhere in the barn darting in and out of the stalls. I saddled CJ up and one kitten ran in behind the horse and then ran back out under the stall gate. 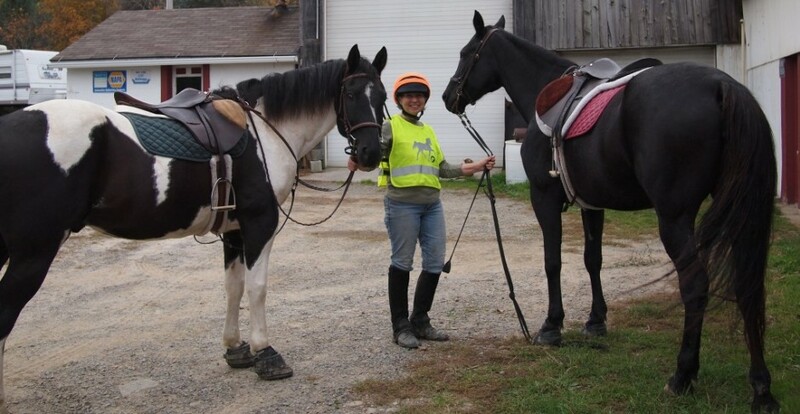 Two kittens ran into Peppers stall and sat down under the horse’s water pail, a third kitten ventured behind the horse and sat down next to her back foot until Emma shooed it away. The little rascals were playing and wrestling each other in Myrtle’s stall, darting out into the pasture under the barn door and running back in, their backs arched and ready for play. Outside, the kittens climbed the stacked logs waiting to be split and crawled into small places near the burn barrel. Emma and I mounted up and turned toward Oakfield Road. Donna had just arrived and we met her walking down to the barn. “Did you see the kittens?” I asked. “I know. I hope they don’t get hurt,” Donna said. Connie put a notice on the bulletin board at her job to find homes for the kittens. A few days later, I came to the barn and some of the kittens were missing. Three kittens were adopted and found homes inside where its warm and where they can be petted and loved by a human friend, sleep on someone’s lap and enjoy life. However, their brothers and sisters are still in the barn waiting for a home. Many people believe the myth that farms need cats and that cats can make it on their own in a farmer’s barn. This leads to people dropping off unwanted cats at barns in the middle of the night and placing an unwelcome burden on the barn owner. As a result, there are now 4 very tame and friendly kittens still waiting for homes at Ballentine’s Horse Heaven. Hopefully someone will call. If you are looking for a bundle of furry joy and interested in adopting a kitten call Connie at 570-888-2024. For all those people who thought about letting their cat retire to the country in a nice barn please think again – ask the barn owner if they need or want another cat. You may find out that the barn is already full. 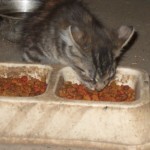 This entry was posted in Uncategorized and tagged abandoned cats, animal care, Ballentine's Horse Heaven, barn cats, horses and cats, kittens in horse barn. Bookmark the permalink.